Description/Historical Information: St. Andrew's Home - Church of England Waifs' & Strays' Society. John Winfield was the Master, Miss Hewitt was the Matron in 1911. 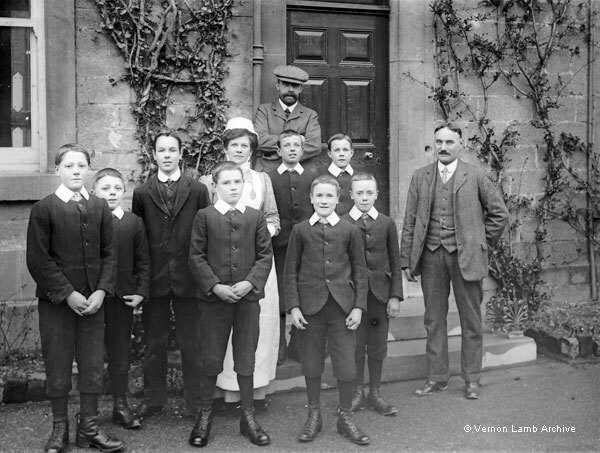 The boy standing in the front row next to Mr. Winfield was Walter Frederick Woolstone [also see VLA4867, VLA4868 and VLA 2536]. The home opened in 1901 and could accommodate 40 boys. It had opened through the generosity of Mr. Ernest Henry Bailey who is the gentleman wearing a cap at the back of the group. This picture was published in The High Peak News of 4 Apr 1914, saying it showed some young people were departing for Canada, indicating that four were heading for Canada and a further two were heading for a training ship, though it did not say where this was.